The radiant sensor, ignitor, and valve coils should all show continuity. The ignitor will have a resistance in the range of 100-300 ohms and will increase as the ignitor gets older. The resistances of the coils will be higher. This page has detailed explanations and specs on the valve coils. 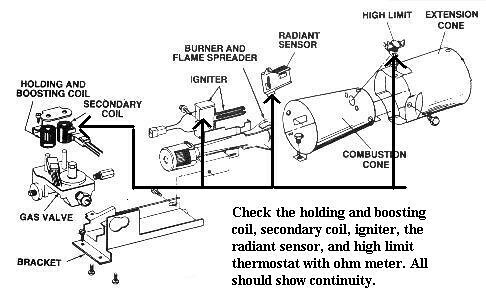 The only component not shown in the photo above is the high limit thermostat, which is attached further down the burner cone, shown here. This entry was posted in Dryer Repair on September 19, 2006 by Samurai Appliance Repair Man.